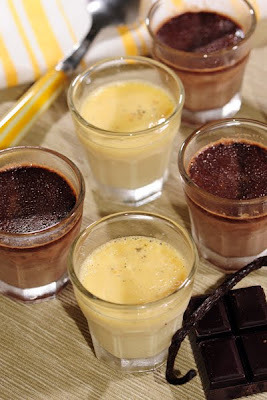 Petits Pots de Crème are a very common dessert in French families. My grand-mother would make some for us with fresh milk from the farm. I don't know why but she would always put a leaf of Cherry Laurel in the cream to flavor it... but please don't do it because I just found out that Cherry Laurel is poisonous! Fortunately, she did not make us her cremes too often! Crèmes are so common that you can find it in ready-pack (you just add warm milk) or in thousands of little jars in the large dairy sections of French supermarkets (we, French, take our dairy products VERY seriously, just in case you had not noticed before). I had not made crèmes in ages but I thought that it would be a great dessert to make for my children. On my last trip to IKEA, I had bought tiny glasses to be used in food presentation. I realized that they were actually the perfect size for children. As already written in my post on Snacks, one key element to fight obesity among children in the US (and adults for that matter) is portion-control. I never thought about it until I came to the US and was served food in portions too big for me to eat (and I can eat!). Funny enough, the dishware we bought while settling down in Upstate New York are huge by any French standards... and obviously, the psychological effect of not eating a full plate of food is hard to fight... to the point that I sometimes eat my entree in the dessert plate! Same thing with our glassware (brought back from South America). My husband was serving us a drink one day and as he was offering me a second serving, I just wondered how much I was drinking! We took a bet... and started using a measuring glass to measure its content. What a shock! The glass contained more than a full cup of liquid (250 ml)! Fine if you drink water... another story when you use them for cocktail drinks! The petits pots are very easy to make and don't require much work once they are in the oven. Some people would make them with heavy cream but I generally only use whole milk. While the traditional ones are made with vanilla or chocolate, you could also try other flavors (lemon, lavender-infused, etc.) The very good thing about them is that you can make a few and then keep them in the fridge for a few days. The bad thing about them is that they are so good that you end up eating them faster than you thought you would! Bon Appétit! In a large pot, pour the milk and the vanilla bean, bring to a boil, turn off the heat, cover and leave it infused for half an hour (you skip this step if you use vanilla extract). In a large bowl, mix the eggs (+ egg yolk) and the sugar. Add the warm milk. Add a little bit of water to the chocolate, put it 20s in the microwave to melt it. Mix it to reach a smooth texture. Divide the cream in two equal parts; pour the chocolate in one half. Place the ramequins in a baking dish. Pour hot water so that the ramequins are half immersed. Cook in the oven for about 20-30 minutes. The center of the creams should be still moving a little bit. Cover them up and put them in the fridge before serving. You could melt the chocolate in a double boiler but I personally like melting it in the microwave. It's faster and requires less cleaning! I like to use dark chocolate with more than 70% of cocoa. Yum. this looks great. And not hard. And since you have influenced me well- I have a constant supply of 70% cocoa. PS Cherry laurel poisonous? Can you elaborate? Isn't it amazing how the most fabulous foods can require so few ingredients! This is a great recipe for pots de créme. Yes, it would be hard to have leftovers. You are right about portion control. We can eat all of our favorites if we learn how to downsize! Thanks for visiting FFC!